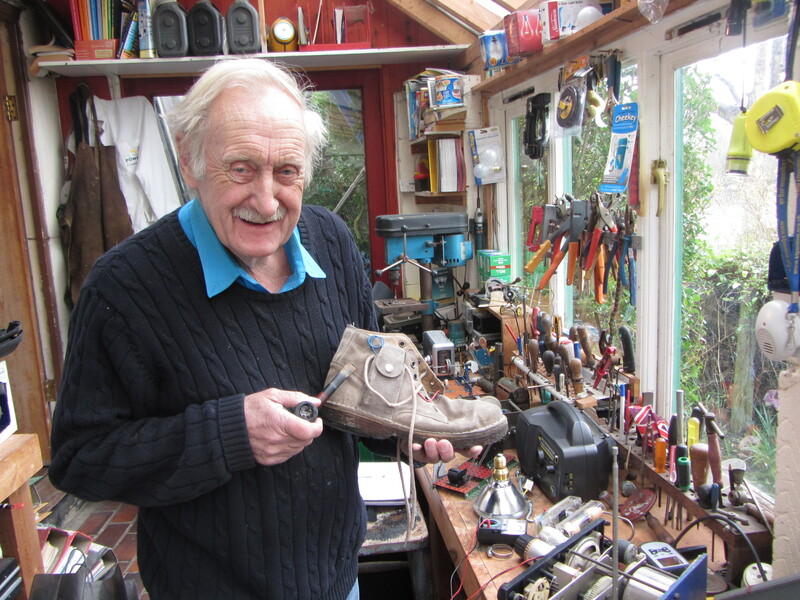 The inventor, Trevor Baylis is probably best known for his invention of the Wind Up Radio, but it is his invention of the electric shoe that brings the thinkgreenfashion team to his home and workshop. An early prototype of the shoe is lying amongst all his many other inventions in an ordered but cluttered workshop. He never throws anything away. On walking, the shoe produces enough power to charge a mobile phone. It is listed in the Guinness Book of Records but so far has yet to find a business sponsor. Trevor believes that it could have use in the military. However the shoe poses a major issue for airport security. Trevor lives on Eel Pie Island that sits within the River Thames, a stone’s throw from Twickenham. The island is accessed via a footbridge. Only 150 people live on the island. Trevor designed and built his own home in the early 1970’s from the money he made as an under water escape artist in a Berlin circus. In his long and varied career, he has swum for Great Britain, been a physical training instructor and acted as a stunt double for Dudley Moore, Peter Cook and Dave Allen. Not exactly the background you would expect for an inventor. His love of engineering was fostered as a child during World War Two. Whilst sheltering from air raids, Trevor started playing and experimenting with Meccano. Using Meccano he builds prototypes for some of his inventions and continues to enjoy playing with it. In 1991 Trevor watched a programme on the devastation of HIV / Aids in Africa. He felt that communication to control the epidemic was crucial. Trevor went into his workshop, designed and built the first ever Wind Up Radio. At 75, he remains energetic and as engaged as ever in the inventor’s world. He has established Trevor Baylis Brands that helps inventors take their ideas to market. He feels passionately about patent protection. What is the secret for such a varied, diverse and interesting career? With thanks to Danny Copley for his help with filming and editing.